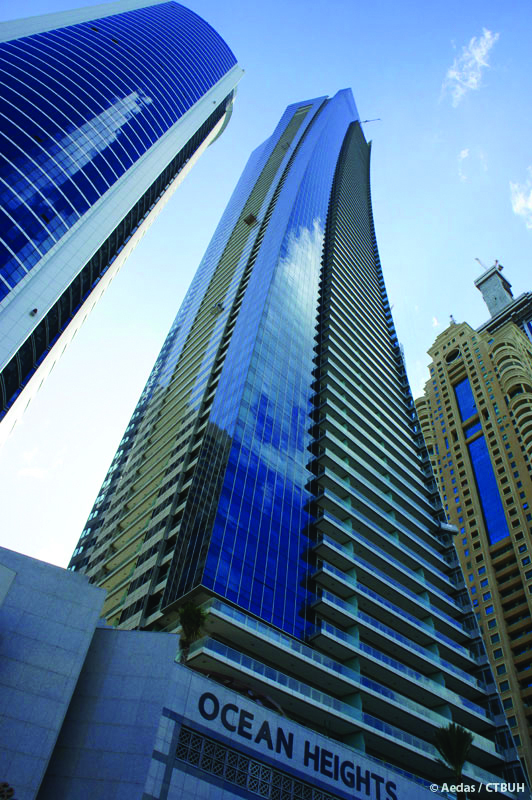 Currently among the top five tallest residential buildings in the world. The 83-storey, 310-metre towering masterpiece is strategically located at the entrance of Dubai Marina, overlooking magnificent vistas on all sides. It houses 608 luxury apartments. Ocean Heights is considered a ‘super slender’ building with an aspect ratio of 9.2 : 1. The design was achieved by twisting the floor plate at every level to create the curved elevation. As it rises, the tower’s floor plates reduce in size, allowing the rotation to become even more pronounced. Meinhardt designed what the industry would term as “true-warped” type unitised curtain wall system through cold-bending of glazed panels, to achieve the distinctive silhouette. Engineering the façade system involved a much more rigorous set of design strategies compared to conventional unitised curtain wall systems.